I was in Whole Foods and they had all of these mushrooms that looked really fresh and delicious, and instantly came up with the idea to create this dairy-free cream of mushroom soup. You can use any kind of mushrooms you want. I used Shitake, Crimini and Portabella. 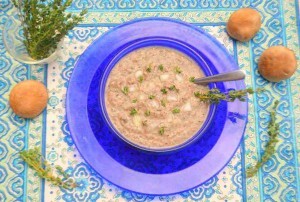 This is a warm, comforting soup which is perfect for this time of year, and will be great when it gets even colder out. First, you want to get all the ingredients together. Chop the mushrooms, garlic, and onion. If you are using fresh thyme, remove the leaves from the stem. Next, melt the butter in the pan. 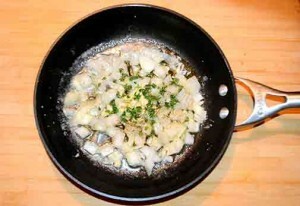 Add the onion, garlic, thyme, salt, and pepper and cook until tender. 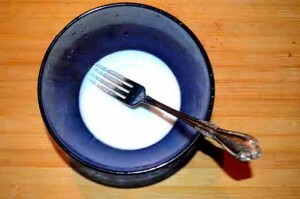 Place the tapioca in a bowl with water. Whisk until smooth. Add the mushrooms, coconut milk, broth, wine if you are using it. Slowly pour in the tapioca mixture while stirring. 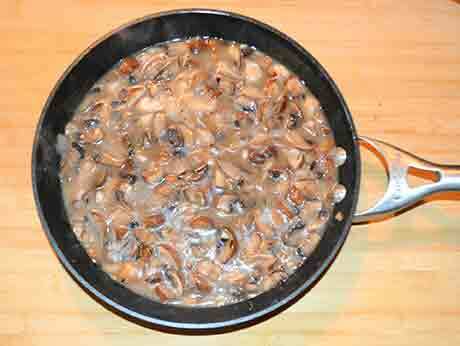 Cover, turn the heat down, and let simmer for 10 minutes until the mushrooms are cooked. Blend quickly for 5-10 seconds so that it is blended but chunky. 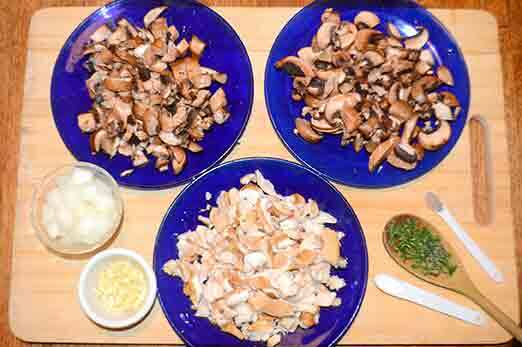 Garnish with thyme and chopped mushrooms. This dairy free cream of mushroom soup is warm and comforting and perfect for Fall. First, you want to get all the ingredients together. Chop the mushrooms, garlic, and onion. If you are using fresh thyme, remove the leaves from the stem. Add the onion, garlic, thyme, salt, and pepper and cook until tender. Add the mushrooms, coconut milk, broth, wine if you are using it. Slowly pour in the tapioca mixture while stirring. 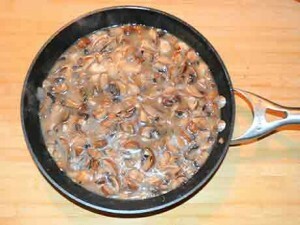 Cover, turn the heat down to medium, and let simmer for 10 minutes until the mushrooms are cooked. Blend quickly for 5-10 seconds so that it is blended but chunky. 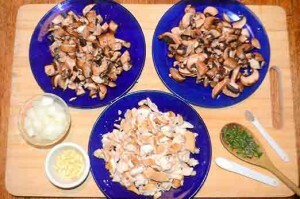 Garnish with thyme and chopped mushrooms.